Sierra County, just north of Truckee and Lake Tahoe, is blanketed with vibrant history, from Washoe and Maidu inhabitants whose relics remain in arrowheads, grinding stones, beads and mortars, to the colorful mid-1800s Gold Rush that lured thousands to the Sierra Nevada. There’s a new blaze of color in the county: barn quilts. The vivid patchworks are hung outside of high barn windows in brilliant displays for passersby to appreciate. Unlike cloth quilts, barn quilts are almost always made from a single square, and use wood instead of fabric. Many of the barn quilts follow traditional patterns. For example, Gary Romano, owner of Sierra Valley Farms, installed a Flying Geese pattern on his family farm barn, which was built in 1936 and is now used for Romano’s “Farm to Fork” dinners. But travel the backroads of this slice of the Sierra and you’re certain to see a variety of the bright, geometric quilts hanging on weathered barns. According to Suzi Perron, author of Barn Quilts and the American Quilt Trail Movement, the barn quilt craze began with Donna Sue Groves in Adams County, Ohio, in 2001. 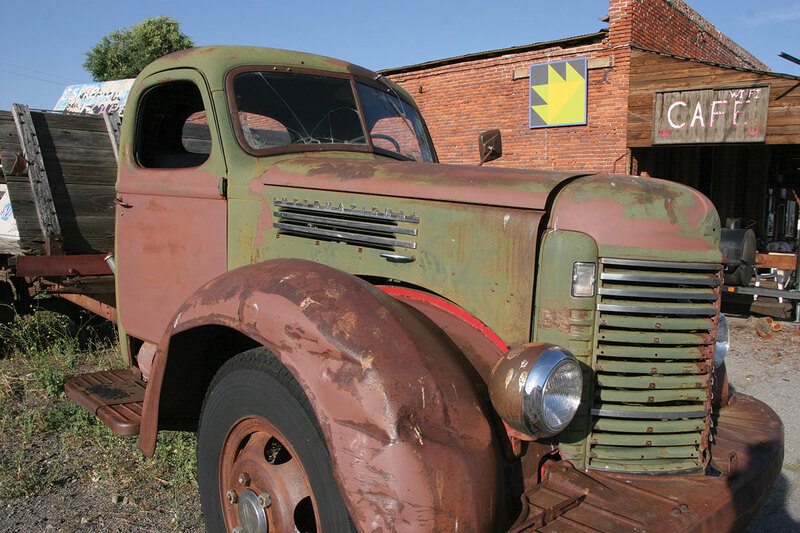 As a child, Groves would play the license plate game with her mother, except instead of license plates, they’d look for barns, which were plentiful on their backcountry West Virginia roads. When the family traveled to New England through Pennsylvania Dutch country, colorful, painted barn-side hex signs captured Grove’s heart. Groves and her mother purchased a 38-acre Ohio farm, and were “thrilled” to finally own a barn. Groves declared the plain tobacco barn “the ugliest barn I have ever seen in my life.” She painted a quilt square to both brighten it up and honor her mom. The idea caught on, so much so that Groves started a “barn trail” where motorists could drive from barn to barn in the countryside admiring the works. Barn quilt trails have since spread across the country, eventually reaching rural Sierra County. more than 3,000 barn quilts have been hung, according to Perron’s website, barnquiltinfo.com. The Quincy Barn Quilt Tour (in Quincy, California, about 70 miles north of Truckee) was founded in 2010. “Now that is a damn good idea,” said Betty Thatcher, a watercolor artist and Loyalton, California, resident. Thatcher approached Sierra County Arts Council executive director B.J. Jordan to discuss a Sierra County trail. “She picked it up and ran,” says Thatcher. Jordan’s family has deep roots in Sierra County. One of her grandfathers was a local judge, the other a sheriff. She spent summers hunting and fishing at Goodyears Bar, built by gold-seeking brothers Miles and Andrew Goodyear in 1849 along the North Yuba River. In its heyday, Sierra County counted between 3,000 and 5,000 residents, with gold the major economy, but it burned in 1864. Nothing from that era but the operating post office remains. Sierra County comprises clusters of small town living. The county is split by the Pacific Crest: On the east slope, the Downie and North Fork Yuba rivers converge in historic Downieville, where Old West structures now house a general store, the Kentucky Mine Museum and a riverside bed and breakfast. Sprawled on the western side is a long valley, home to ranches settled in the 1850s. Tawny expanses of hay fields are dotted with weathered stock pens and pole fences. Black and white beef cattle graze in summer and fall. 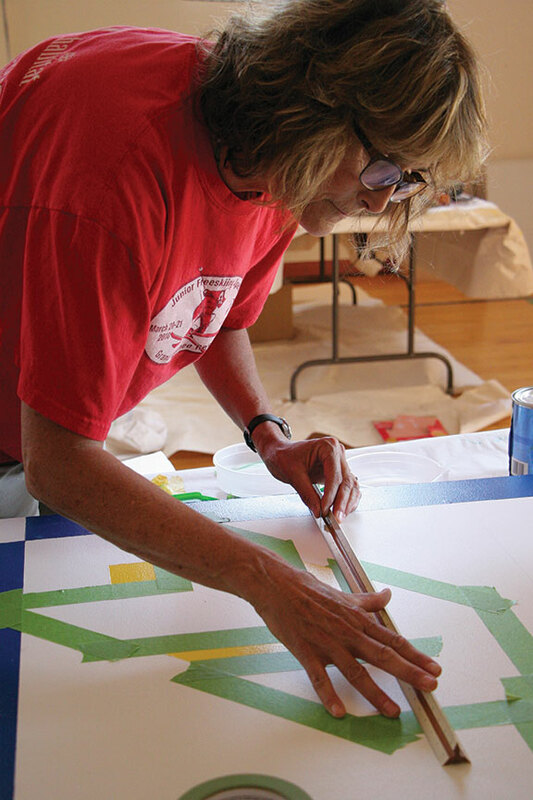 The Sierra County Arts Council is a state-local partner with the California Arts Council. When the Creating Places of Vitality grant became available, it “all went together in my head,” Jordan says. Downieville’s Mountain Star Quilters helped obtain the grant. Matching funds were a required component. Mini barn quilts, using only geometric designs and measuring two square feet, were painted and sold, raising almost $4,000. “They flew out the door like hot cakes,” says Jordan. 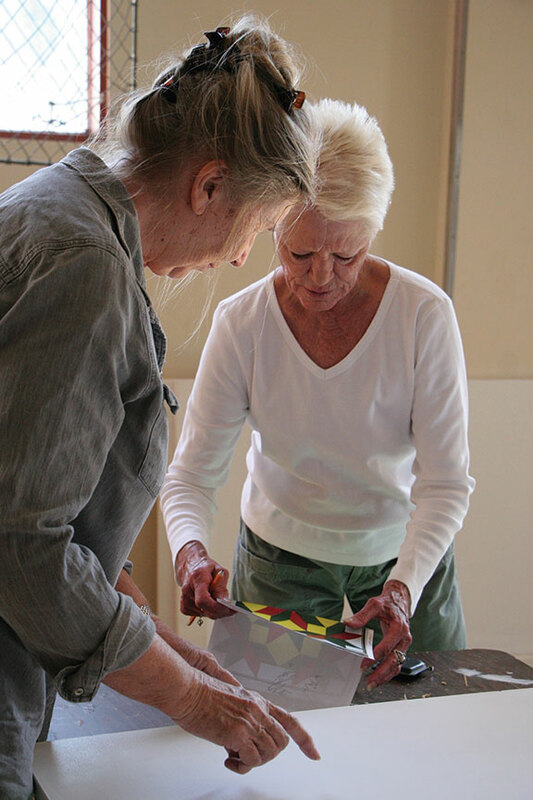 The barn quilt project is more than a grassroots art movement, however: It is uniting Sierra County’s small towns on both the east and west sides. “We are quilting the damn county together for once,” says Thatcher. Jeff Hartley stopped by a weekly Tuesday painting session with his wife, Barb. The Hartleys were 30-year Truckee residents before relocating to the Sierra Valley. They read a notice about the painting session pinned in—you guessed it—the post office. Church’s husband comes from a long line of Sierra Valley ranchers dating to 1853. The Church barn, located in Sattley, California, was built in the 1850s, out of hand-hewn timbers transported from Vermont to California. Constructed with wood pegs and a cedar block foundation on rock, the Church family has owned it since 1895, when it was a milk barn. “I have always loved the flag, and patriotism is an important part of living in the United States,” says Church. 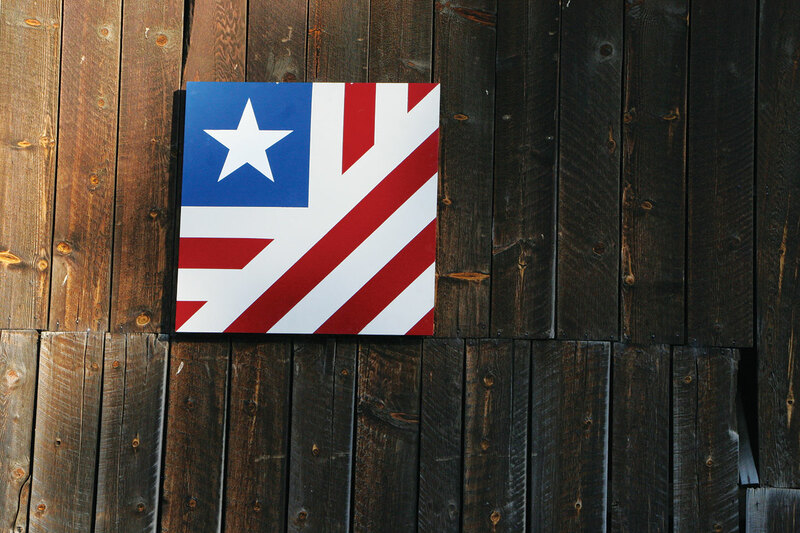 The quilt on her barn was inspired by the Hartleys’ Folded Flag, a geometric red, white and blue symbol. The Sierra Valley Grange boasts a wheat pattern, designed by Jordan herself, in sync with agricultural tradition. Elia and Bruce Miles in Loyalton own a historic granary, built in 1947 of post and beam frame. The structure was moved from nearby Chilcoot in 1950, and now sports a tan and brown-toned autumn flower quilt. Sierra Valley native and contractor Richard Griffin, who often helps hang the quilts—the six square feet and eight square feet designs can weigh more than 100 pounds—boasts a Swiss flag quilt pattern on his barn along Highway 49 to Chilcoot. Countryside barn quilts are a testament to cultural heritage, and the sometimes overlooked woman’s work on a farm. “This project connects the arts, agriculture and preserves the importance of ranching in the valley—honoring a traditional, cultural contribution,” says Jordan. To take the trails, first consult the online map, which displays the location, the quilt name and the barn history. For some of the Sierra Valley’s best barn quilts, meander up State Route 49, named for the ‘49er Gold Rush, over and along the Yuba River’s forks to Downieville. Beyond barns, the Yuba Theater and Downieville Community Hall show off quilts. Or trek up Highway 89, where emigrants traveled the Truckee River to the Sierra Valley’s bucolic mountain meadows. 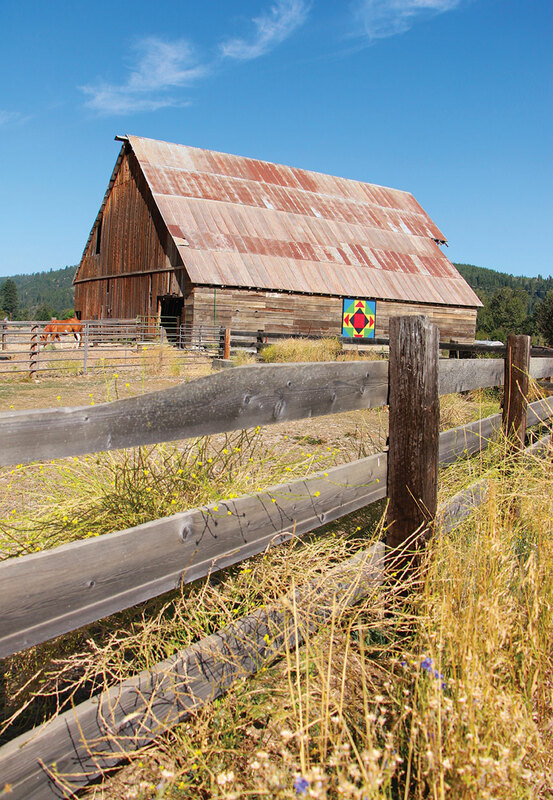 Discover a myriad of mini barn quilts and full-blown barn quilts while enjoying a slice of Sierra County life. The Sierra Valley Barn Quilt Project has stitched residents and a slew of groups together, including Plumas-Sierra Cattlewomen, 4-H clubs, Sierra County Historical Society, Rotary Club, Mountain Star Quilters Guild, East Sierra Valley Chamber of Commerce, the City of Loyalton, Sierra County government, local volunteer fire departments and area students. For more information on barn quilts and map links, find the Sierra Valley Barn Quilt Project and Quincy Barn Quilt Project on Facebook or visitbarnquiltinfo.com. Please keep roadside stops safe and respect barn owners’ privacy. Amy Edgett specializes in photojournalism.